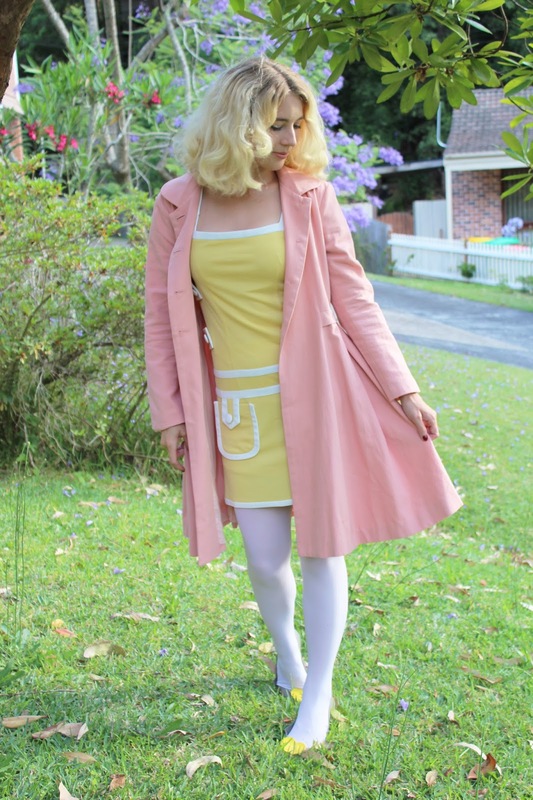 Pink and yellow for this 60's mod outfit! 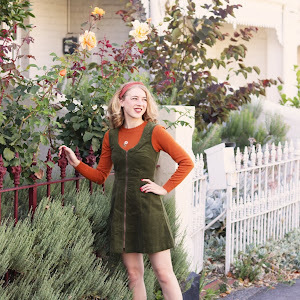 I blogged an outfit by Alice's Pig earlier this year and here I am with another outfit by this wonderful brand. 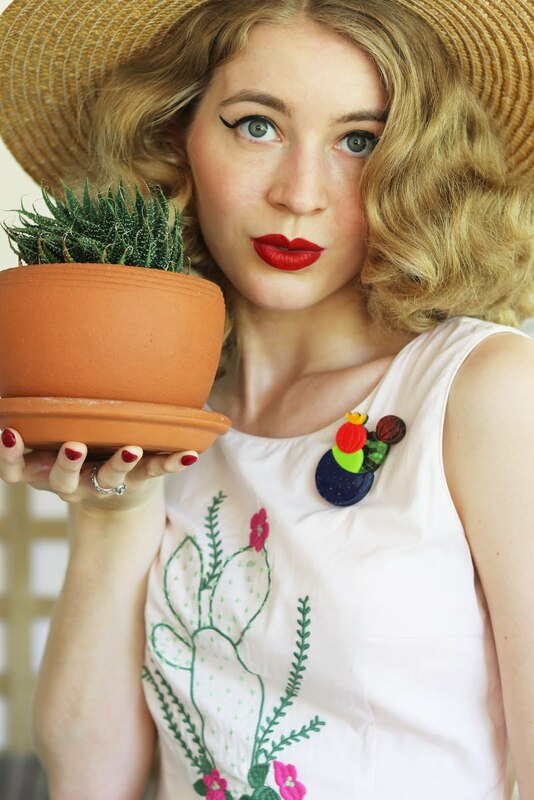 Alice's Pig offer lots of great 60's and 70's inspired designs, whilst all pieces remain as classics for years to come. 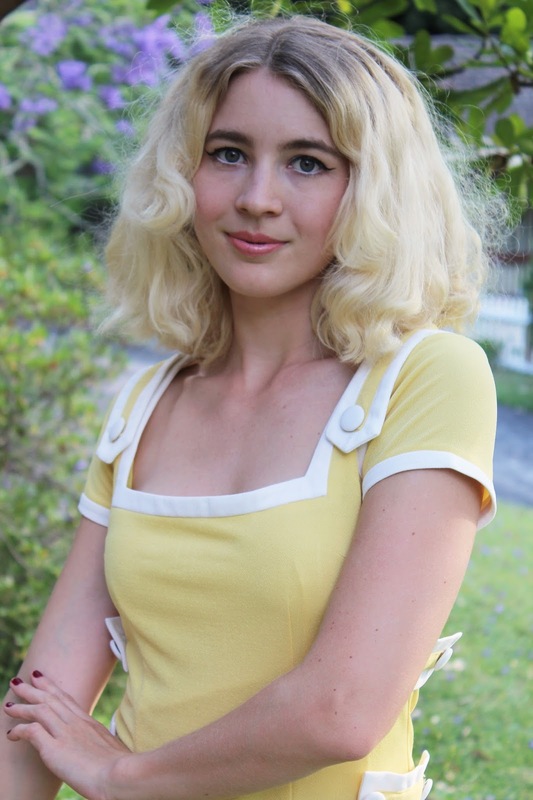 I really love yellow so the Twiggy dress instantly caught my eye + I love a good 60's mod dress every now and again! I went with size 8 and love the fit, it has a slight loose fit on the waist whilst remaining a little more fitted on the bust and hips. The dress is lined, the fabric is soft to wear and the dress length sits about mid-thigh on me which didn't feel too short to wear - I um and ah a bit when skirts and dresses are a little shorter than usual but felt quite comfortable in this one. I was able to get away with wearing stockings this particular day and I think this dress will be great for Autumn, Spring and Summer so I'm sure that you'll see it again soon, especially on my Instagram. After featuring the blue coat back in August the Demi Dallas has since become one of my favourite coats in my wardrobe as I can wear it on cool spring days and layer it up when it is cold... Last time I went with a size 10 coat (I usually size up for coats), it fit well with extra room at the waist (that's the style of the coat) but I decided to try the 8 this time and liked this fit too, I did like that it was a little more fitted on the waist. There was still plenty of room for comfort in the arms and shoulders too, but considering it is designed with spring in mind I have mainly just worn thin dresses and tops underneath. P.s. these coats have pockets... Always important. Have you ever ordered a coat and the pockets have been fake??? That annoys me so much! I'm sure that you have noticed my hair regrowth, I've been growing out my natural darker blonde colour since May. I was going to dye it a colour to match but decided to just let it grow out as normal. My hair used to be the bright white blonde throughout my childhood, it started to go darker and then I would dye it and now I want to go to my dark blonde colour... Once it has fully grown out I may add a few highlights but I'm liking where it is at now and don't mind the roots exposed for 60's and 70's looks. 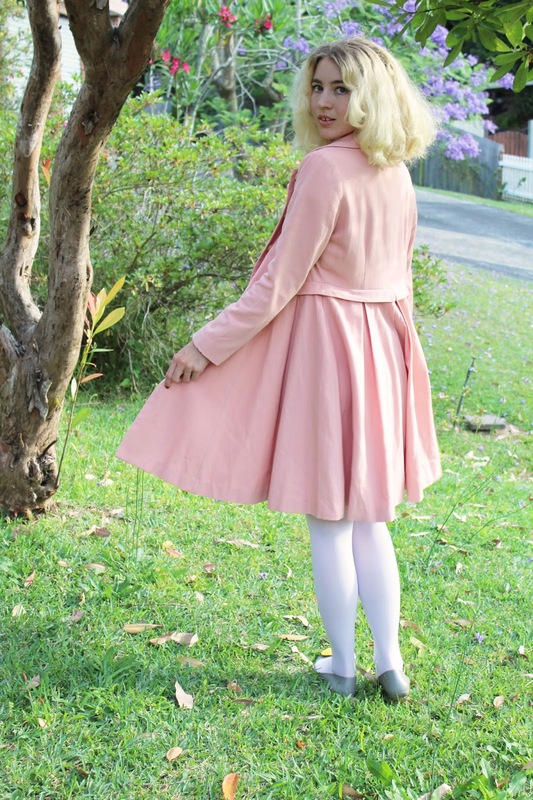 Be sure to check out their full range of coats and dresses by Alice's Pig, they are gorgeous! Both the dress and the coat are absolutely amazing! They look greaton you. Aww! The 60s suit you so well! You are too cute! 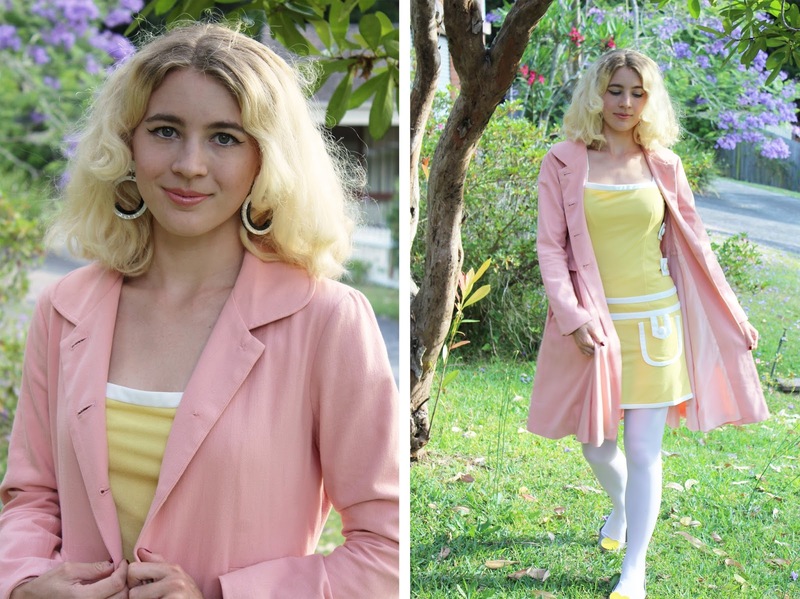 I love it when you bust out a 60s look - it's an era that really suits you. I'm in love with the yellow dress - all of the details are absolutely perfect. On a side note, white tights are so hard to pull off, but you're definitely making them work. My absolute favorite decade on you Kayla! Love seeing these colors on you too. So perfect! The white tights totally complete the look for me. Really brings everything together so harmoniously! Lovely colour palate too, so soft and feminine. Amazing look!